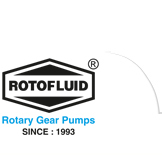 Fluid Tech Systems offer “ROTOFLUID” brand internal gear pump Model “FIG” (Fuel injection Internal Gear Pump, LDO Gear Pump, Burner Firing Gear Pump, Boiler Firing Gear Pump, FIG Pump, HSD Gear Pump, Diesel Filling Gear Pump) which is high precision and fuel pressuring type positive displacement internal gear pump which prepared by graded cast iron. These nitrated gear , shafted rotor give better performance with closed tolerance to give long life. Model “FIG” is flange mounted. 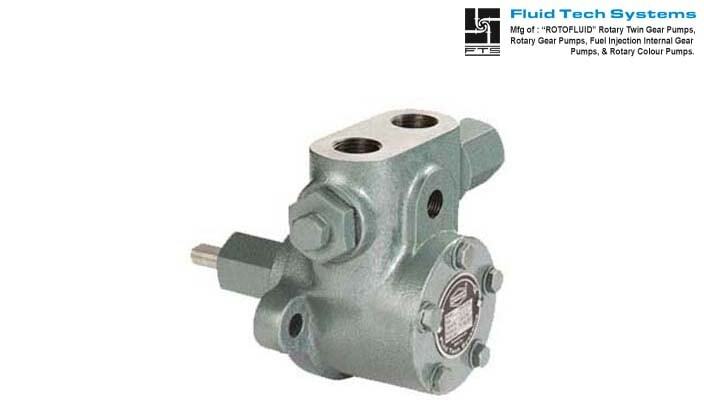 These pumps are self priming type produces maximum, vacuum determined by the cavity between the gear teeth. These pumps modified profile teeth cutting to give accurate capacity with in the pressure range. These pumps are capable to run liquid up to 500 CST viscosity and up to temperature 200ºc. The sealing is done with mechanical seal to ensure zero leakage. The suction and delivery connections are available in 3/8",1/2",3/4"and 1" size. Model “FIG” pump come in a capacity Range of 60 LPH to 6000 LPH with operating pressure up to 35 kg/cm², yet for continuous duty maximum recommended pressure is 30kg/cm². These pumps can also be used at 2800 RPM. The capacity will have approx double of normal duty condition. These pump can be run both clock and anti clock direction as per requirement. Flange and Foot mounting option. Optionally available in investment casting. Maximum temperature up to 200º c.
Available with or without built-in pressure relief valve and external by pass. Highly used in fuel injection Burners, Boilers, Furnaces. Booster application in diesel locomotive. Eventually with separate pressure regulating valves. For gas oil, medium, heavy and very heavy oil. Pump suitable for LDO, FO, HSD and LSHS.